The following is the part THREE of messages that we received, during our most recent journey to Palenque, in December of 2010. You can find other and future messages posted on our website at www.AlunaJoy.com under the link entitled "Articles on Personal & Planetary Transformation ". We are sharing this message here with you just as we received it, in present time, with little editing. We do this for a very important reason. We know that the messages that we receive are not just for our groups, but are for humanity also. So as you read this, just imagine that you were there with us . . . the Masters and Star Elders assure me that the message and the corresponding energy will be transmitted to you. 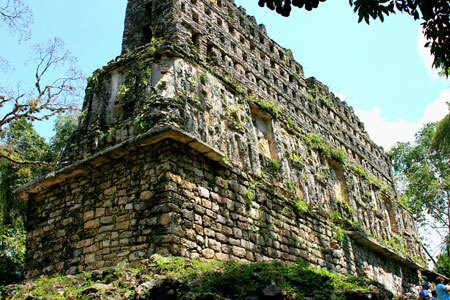 You might want to imagine that you are sitting with us in the Maya Temples. On this day, December 12, 2010 (a sacred day in Mexico known as The Day of Guadalupe), we visited the sacred site of Yaxchillan. We were at the highest point in the site . . . sitting on the steps of Temple 40. During this message, we made the Forever Young Essence. Enrique had just finished doing some ceremony, and Aluna mentioned that the Star Elders had a message. Aluna: This has been the story the entire trip. The Star Elders say to just open up my mouth and start talking, and it is going to happen. Okay, the howlers monkeys are answering back. That is always a good sign. So get comfortable in a place where you can hear. Let us see what is happening. While Enrique was doing his ceremony, he was using the sacred Buddha water in the four directions. At this time, the Star Elders began to show me a huge ocean. I thought to myself "Okay . . . How am I going to explain this? We are in the jungle". Ohhh . . . I see now . . . Imagine that your heart is a bowl; a huge sacred vessel. Inside this bowl is the entire ocean of great potential for our future. It also looks like an ocean of stars. It is an ocean of universes. What the Star Elders want you to do, if you will, is to allow this ocean of great potential . . . this ocean of stars . . . to pour down into the center of your heart. The Star Elders want to pour this potential into your crown chakra and have it flow to your heart. It looks like the shape of an hourglass. So this ocean of stars is going to start trickling down from a higher dimension into this one. This energy is going to go throughout our entire bodies . . . into every cell in our body. The Star Elders say this ocean is going to quench our thirst. This thirst is the un-definable desire for something that we yet to know. They say it is a beautiful, blissful bath of energy that will clean off what little bits of fragments of things that keep us from manifesting this nebulous desire. Archangel Michael has arrived now. He has a great sense of humor, and he just said "The stars are little scrubbies." These little scrubbies will help scrub us clean. 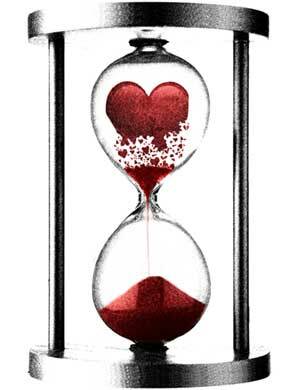 This hour glass is also like the chambers of your heart. This potential and ocean of stars is going from one chamber of our heart to the other. It might help if you image this hourglass turned sideways. Keep in mind, this is our etheric heart, not our physical heart. This is a continuation of what we saw the other day (Read prior messages on our web site at www.alunajoy.com). This is your multidimensional merkaba heart, and the Star Elders are pouring in a vast ocean of stars into our present heart and this is tricking into our future heart. So … the ocean of stars is going from our present world heart down to our future heart. Only energy that is absolutely pure and applicable to the future world can pass through the eye of the hour glass. The Star Elder's say this is what some religions call the eye of the needle. The Star Elders are giving us tools for the future to use in the emerging new world. This ocean of stars is going into the future chamber of our heart, which is the chamber of the heart that we will operate from in the new world. This is the part of our heart that we have been holding back. It is the place where we have hidden the best of our light. We saved it for this time. This hourglass is a bridge between this world and the next world. This hourglass is dropping, bit by bit, little stars. It appears that it is going to take some time to get to the end of this download. It is pretty clear that we won't finish this process while we are sitting on top of this pyramid. It looks like it is going to keep going until we shift to the next world. They are showing me this long timeline with notches in it. And I asked "Oh, that must be the calendar . . . our cycles of life?" They answered "YES . . . this download will be complete at the end of the calendar cycles." (There is much debate on what date this is.) What this energy passage is going to do for us is gracefully pick us up from this world and place us very gently down into the other, because we are living in the HEART! Okay, now they are looking at every single one of you individually (and the ones who read this). They are telling me some things that are specific to some people in this group. They are not going to tell me who, because I don't want to know. But some people have grains of sand, in the hour glass, that are bigger than others, and these are tiny, little blocks inside of you. So . . . if it is okay with you, if you feel like you have blocks, give Archangel Michael permission to clean them up and reduce their size so they can get through the hour glass. Archangel Michael says "Don't be pretty about it. Just say I am going to go in and smash them up." He says "I want to smash those blocks, so they are smaller . . . so they can get through easily." The goal here is to have no hesitation in our ascension to the next world. If we hesitate, we lose our flow. So if you are willing, this will evolve smoothly from the old world to the future world . . . like liquid stars. From what I can see from this point, this smashing is not going to cause you any backlash. That is nice to know. :) I am seeing that this is just going to make life easier. They are showing me the ocean again . . . So there must be something else they want me to see. This ocean is the creative force of the universe. It is the energy of which all things are manifested from, and it also has a powerful rejuvenating quality to it. It is universal abundance. So as this ocean of potential is washing over us, through our hearts and over our bodies, it has a wonderful rejuvenating quality. Forever Young! If you read any of the master teachings, they say that all the Masters are always at about the age of 30, and they never age. So right now I am signing up for an extra dose of the ocean. I would like to go back to 30. Then Archangel Michael popped in and said, "Howard (a group member) wants to go back to the 60's" (the group roars). I guess they got your number, Howard. Okay, they are turning the page and looking at the site that we are sitting on. They are looking at seeing what the energy of this place can do to help us. Again, they are showing me that the site has to do with water. I have always related Yaxchillan to the Earth, but they are showing me water, and it is almost like the air is full of water. I don't think that means that there was literally water in the air, but I see the spirits of whales going overhead in the sky. They are huge whales. Whales hold the history of all creation in them, because they came from the primordial waters. They are still one with the waters from which all life came from. They also understand the sound of which we use to create things from. The howler monkeys teach this to us also. This sacresd site has combs on top of the pyramids, which means that this site also taught the use of sound to manifest. I am being told that the whales hold the knowledge of inner-dimensional travel, and they understand the history of creation from the time when mammals emerged. It looks like the whales are swimming above us, and we are also swimming within this knowledge of multi-dimensionality and cosmic creativity. I am also seeing the whales connecting to Lemurian energy, because the Lemurians knew how to use sound to create other life forms. They didn't procreate like we do now. They could manifest a life with intent and sound. We are learning how we can use that same knowledge to manifest a new physical reality. Is anybody feeling kind of woozy? I am getting woozy, like I am walking on water, or on a boat. Group member Lisa shares: I thought I was going to go into another dimension. Aluna: Okay, the page is turning again . . . remember the hourglass, and the water with the stars, and the ocean with all the creative potential in the universe coming into us? Now the Star Elders are starting to spin it. It almost looks like a cyclone. It is spinning in one direction and then the other way. They say it doesn't matter which way you see it spinning. It spins one way, and when it goes through the middle of the hourglass, it goes back and reverses, and it spins the other way. That door, between the top of the hourglass and the bottom of the hourglass, is how we get from one dimension to another. Does that make sense? So, inside of each one of you, right now they are programming you, with your permission of course, with the knowledge of the door between the dimensions. They are helping us reset our gyroscopes, because when we finally relocate to the other side, life won't be spinning the same way. It could be a little disorienting, but they are doing this very gently by taking your etheric heart to the other side first, so that when you go through, you will have a place to land, and it won't be so challenging. The Star Elders are saying that if we try to rush it and push it, we will make it harder on ourselves. They have been telling me this for weeks now . . . "Don't jump off the diving board until it is time", "Don't push the clock. If you push it too fast, you will have physical consequences". The first physical consequences will be a lot of nausea and probably headaches, and you will lose your flow. Some of us are going to push anyway, because we are spiritual speed freaks. This doesn't mean that it is going to hamper our evolvement. It means that it might be a little more uncomfortable than necessary. So if we want the easy way through, wait until it feels right . . . then leap without hesitation. If you feel queasy or nauseous or get a headache, pull back and relax. This going to come in lots of little stages and waves, between now and the time we relocate. Many of us are already ahead of ourselves, and we are already in that other dimension in many ways. Most of us have dreamed about it, thought about it, and imagined it. Because they have been putting oceans of stars in our heart, it makes us feel lighter. Watch how you feel now. They say we are going to feel lighter. Yesterday in Bonampak, we got downloaded with a lot of wonderful stuff. Now they have sorted things out, and they are putting all of that knowledge that we gathered into our multi-dimensional heart. That is going to make us feel lighter. Group member Howard shares: As I walked in today, I heard them say "Yesterday you got your power, and today were going to show you how to use it." So again the page turns . . . and what they want to do now, with your permission, is to seal all that we have pulled in at this time, and put a bubble around us to keep this process going for a while. Some of this is going to continue up to 2012. If you don't like the way it feels, you can tell them to stop at any time, and put the brakes on, and they will do this for you in a split second. This is your journey; not their journey. They are not going to do anything against your will. If it feels good to you, keep it up. If it doesn't, back off. If you start feeling nauseous or headaches or pressure because you are impatient, back off and slow down. There is no reason why this needs to be challenging in any way. The underworlds have been cleared out, and we can evolve now with ease and grace. So we learned something today that Yaxchillian represents the cosmic ocean of potential and rejuvenating energy. It is the primordial juice that everything is manifested from. Maybe that is why the Maya named this site Yaxchillian - the Eternal youth, the creative, primordial juice that makes everything manifest. I am glad they allowed us to make an essence today. Everything that manifests in this world is created in Spirit / frequency first. So, the new world is becoming known to us now through a frequency. So, how are each of us going to know this energy / frequency, because we are each unique? Everybody's ears, or inner ears, hear things differently than you. If you compared what you hear to what others here, sound is going to sound different, but it is the same sound and the same frequency. If I say that the sky is the color blue, everyone's perception of this blue would be a little bit different. How we see color and how we hear our world is unique to each of us. We think that we see the world the same way, because we see it OUR way. But the Star Elders have always told me that this is not true. If we could switch with another, and we could see through somebody else's eyes, it would be mind-boggling, because we see things so differently. All personal to global conflict in this world is based on this fact. We argue about our differences, and we forget that we have the same goal. We are all on the same path. So how are we going to know the new frequency so we can leap? Listen to your heart. It's that SIMPLE. It might be something you hear when you are being very, very still, and it is a hum, or a sound, on the inside of you, and you follow that. The way the Star Elders go from one doorway to the other is very much like the howler monkeys do. I know that by meditating with the howler monkeys you can plug into the sound of the universe . . . the sound of the creative force of the universe. It is the sound behind the sound that you listen for, and that is the sound of creation. But I guess the whales are going to assist us on this one, and that is why they are here today. We were then given a quote written by Celia Fenn from one of the people in our group. Celia Fenn channels Archangel Michael each month: "By the 12/12 Stargate on the 12th of December, you will be ready to give form to this new direction in your life. The energies of Higher Consciousness will manifest in New Directions for Work and Relationships. Beloved Ones, if you feel confused and lost in these powerful new energies, know that you are supported in this Grand Process of Transformation and that it will be brought into form and into alignment with Divine Will by the end of the year. Remember to use the gifts of Compassion and Grace for yourselves and to expect Synchronicities and Miracles in the Flow of Divine Love." So it is a great blessing that we were drawn to shift our schedule and be here in Yaxchillian today. This is a site that emanates the energy of the pure ocean of cosmic creation, the "Forever Young" and all things new. It is a special day for us today. Thank you great Creator and the Star Elders for allowing us to swim in this beautiful energy and absorb it into our hearts so that our relocation into the new world will come with great ease and grace. We are so grateful.